You’ve had the baby. All the anticipation and waiting has finally ended the second you hold your new one. And then the weeks/months of special bonding begin. You can no longer imagine life without this little human. Your whole world revolves around them, their sleeping and eating schedule, and at the first fuss or cry you are right by their side. Truth is, you love this new addition so much and can’t even remember the life before baby. But then your girlfriends give you a call, it’s been months now since the whirlwind of the newborn days. And so after pregnancy and everything that happens after that there is another milestone that moms reach. The first time mom spends an evening out of the house–without their baby. This is a big deal and lots of preparation goes into making this possible. You likely need to have bottles pre-made, perhaps baby food, and an assortment of other things. You’re the mom, you know. So whether this is a date night with hubby, or a lighthearted evening catching up with friends, that first night is always a notable moment on the post-birth calendar. 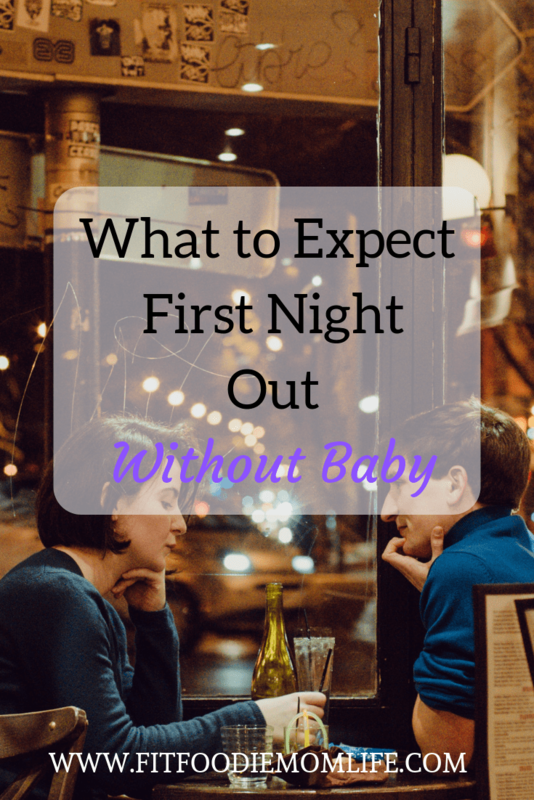 If you are currently contemplating the first night away from your new baby, here are a few things that you might find helpful to know. Some moms are very ready to finally catch a break and head out for a great night. Other moms miss their baby the second they step outside the house. Both are completely normal and one is not better or worse than the other. It’s entirely normal to feel separation anxiety from your little one. My first evening away from my babies was fun and refreshing but I constantly checked my phone for any updates and missed my baby so much. I had mixed feelings of freedom but also missed my baby. Be easy on yourself and open to any feelings you might have. Also, avoid setting any expectations. Keep yourself open to whatever the night brings and how you feel. 2. How Much Booze Can You Have Now? After months of saying no to alcohol during pregnancy, you will likely find that your alcohol tolerance is far lower than it was pre-pregnancy. I’m not a drinker so I can’t testify to this, but I have friends who have shared their experiences. You may find yourself feeling unwell during your night out or may find your tolerance has changed, leading you to drink more, and thus run the risk of getting into an accident from a DUI on your drive home. It’s probably best to ease yourself into your past social life and drink water. Also preparing ahead of time to use an Uber or Lyft is the safest way to get home. This is most likely a definite. If you decide to have a few hours away and baby is only six weeks old or six months old, you will still experience a level of judgment from someone. Everyone has their own opinions on how long a mom should wait before going out. My advice on this: go with what works best for you. Some people believe that new moms should wait for a set period of time – even years – before going out. Others believe you should go out whenever you feel ready. There is no perfect time, and yes baby is perfect, adorable and important, but you matter too. It’s essentially healthy that you take care of your mental and social health as well. You might need to prepare yourself mentally and emotionally to separate yourself for a few hours. Baby will be fine. I’m sure you will hire a trustworthy sitter to keep your precious bundle. It’s also important to reconnect with your husband after having a baby. Those first few months can be especially draining and exhausting and can cause some separation from your spouse. Don’t forget to date your spouse, he came first! Enjoy and try to relax!